Receiving far less fanfare than the UNIQLO partnership with Novak Djokovic, Kei Nishikori and wheelchair tennis star Shingo Kuneida is Tomas Berdych’s endorsement of Swedish chain H&M (Hennes and Mauritz). Berdych quietly signed a partnership with H&M shortly before the Australian Open in January, and in doing so, broke ground by becoming the first tennis star to serve as ambassador for the label. 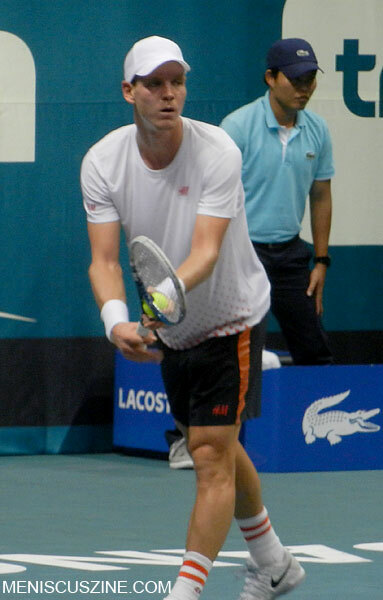 At the 2013 Thailand Open in Bangkok, Berdych wore head-to-toe H&M with the exception of his Nike shoes: hat, wristbands, shirt, shorts, even the socks. Although H&M is known to be more cutting edge than UNIQLO – the label, after all, has staged runway shows at Paris Fashion Week – Berdych’s tennis attire is surprisingly more minimalist than what Djokovic and Nishikori have sported this season. Berdych’s H&M threads incorporate a classic white shirt that would not be out of place at Wimbledon save the red speckles adorning the bottom, as well as matching socks and navy blue shorts. Frustratingly, much like Nishikori’s UNIQLO gear, Berdych’s H&M outfits do not seem to currently be sold online. While Djokovic’s Grand Slam uniforms are all available on the UNIQLO UK e-commerce site, H&M has been rather cryptic about its arrangement with Berdych, other than to state that the Czech would help the company design some menswear. One wonders what the strategy is for a high street label to select athletic ambassadors who play in a year-round sport, but keep their clothes off the shelves.